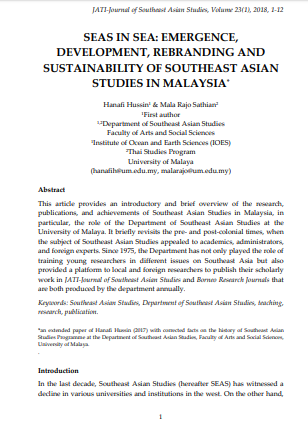 This article provides an introductory and brief overview of the research, publications, and achievements of Southeast Asian Studies in Malaysia, in particular, the role of the Department of Southeast Asian Studies at the University of Malaya. It briefly revisits the pre- and post-colonial times, when the subject of Southeast Asian Studies appealed to academics, administrators, and foreign experts. Since 1975, the Department has not only played the role of training young researchers in different issues on Southeast Asia but also provided a platform to local and foreign researchers to publish their scholarly work in JATI-Journal of Southeast Asian Studies and Borneo Research Journals that are both produced by the department annually. Keywords: Southeast Asian Studies, Department of Southeast Asian Studies, teaching, research, publication. HUSSIN, Hanafi; SATHIAN, Mala Rajo. SEAS IN SEA: EMERGENCE, DEVELOPMENT, REBRANDING AND SUSTAINABILITY OF SOUTHEAST ASIAN STUDIES IN MALAYSIA*. JATI - JOURNAL OF SOUTHEAST ASIAN STUDIES, [S.l. ], v. 23, n. 1, p. 1-12, june 2018. ISSN 2600-8653. Available at: <https://jati.um.edu.my/article/view/12183>. Date accessed: 21 apr. 2019. doi: https://doi.org/10.22452/jati.vol23no1.1.